Credit Suisse plans to move about 250 banker jobs out of London under its first phase of Brexit planning, according to reports. Employees in areas such as trading and mergers and acquisitions were likely to be relocated to Frankfurt or Madrid, Bloomberg reported. The Swiss bank employs about 5,500 staff in London. 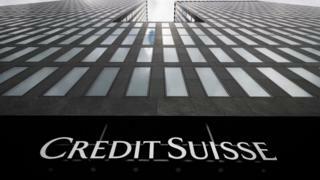 A spokesman said Credit Suisse "continued to investigate its options". According to Bloomberg, the bank had considered relocating staff to Paris but backtracked after holding talks with local regulators and government officials. Credit Suisse is one of the biggest investment banks in London. It is one of the few European banks yet to announce contingency plans for Britain's departure from the European Union. Deutsche Bank has said it will move an unspecified number of jobs to Frankfurt, as well Milan and Paris. HSBC and UBS have also said they would relocate roles, while last month Goldman Sachs said its contingency planning was reaching the point of no return. Earlier this month, Credit Suisse chairman Urs Rohner suggested banks would have to trigger their contingency plans within two or three months due to a lack of clarity over Brexit negotiations. A spokesman for the bank said: "Credit Suisse continues to investigate its options as to the best way to maintain access to EU clients and markets by leveraging existing infrastructure in the event of a hard Brexit." Last year, the Bank of England said that up to 75,000 jobs could be lost in financial services following Britain's departure from the European Union. Even so, London would remain Europe's biggest financial centre, with financial services in both the capital and other parts of the UK employing more than one million people.